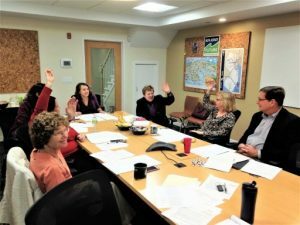 The inaugural New Jersey One Water Awards, sponsored jointly by Jersey Water Works, the Association of Environmental Authorities of New Jersey, and the New Jersey chapter of the American Water Works Association, have been awarded to four projects that highlight innovative best practices in management across the full water cycle. The awards were developed to honor initiatives that exemplify the principles of the One Water approach: the belief that all water- stormwater, drinking water, wastewater- has value that can be unlocked by implementing sustainable, inclusive, and integrated water resource management practices. The City of Hoboken’s Southwest Park, one of two winners in this category. 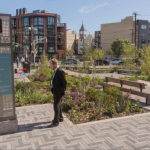 Southwest Park is the first resiliency park in New Jersey, a one-acre area that incorporates significant stormwater management mechanisms to help control chronic flooding. The City received public input on three occasions on the park’s design and features, and the park’s interpretive signage provides educational opportunities to visitors. The Landis Sewerage Authority in Vineland, the other winner in this category. As part of the authority’s operating practices, it returns treated wastewater to the ground for aquifer recharge; draws power in part from renewable sources and from co-generation; and fertilizes its 400-acre farm using biosolid byproducts from the co-generation process. The Authority partnered extensively with community and environmental groups and its programs include many opportunities for public education. 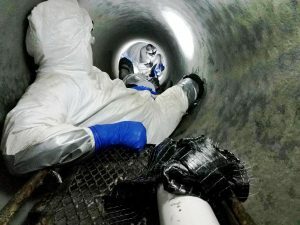 Middlesex Water Company, for its assessment/repair of a 30-inch transmission main under a major highway using internal application of carbon fiber-reinforced polymer, the first time this rehabilitative technique has been used by a water utility in New Jersey. 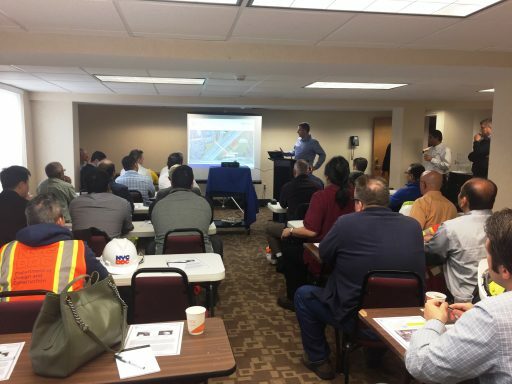 The Company hosted an information session and invited neighboring utilities, construction and engineering firms for an onsite visit to demonstrate this unique rehabilitation method and to see the application of the unique polymer product for themselves. 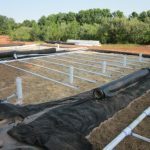 The Stony Brook-Millstone Watershed Association, for its construction of an innovative wetland wastewater treatment system to replace an earlier failed septic system at its Watershed Center in Hopewell Township. 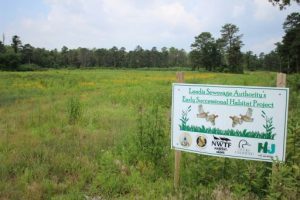 The Association’s project promotes public education through interpretive signage and an audio tour to explain the wetland to visitors. Jurors are asked to recuse themselves from deliberation of any entry that presents a conflict of interest. The winners were announced at the Association of Environmental Authorities conference. Awards were presented at Jersey Water Works’ annual conference, and they will be recognized at the American Water Works Association conference in March 2018. The southwest corner of Hoboken has long struggled with flooding–a chronic problem that came into sharp focus during Hurricane Sandy. The area sits on a former marsh that had been filled in and paved, making it vulnerable even to small storms. 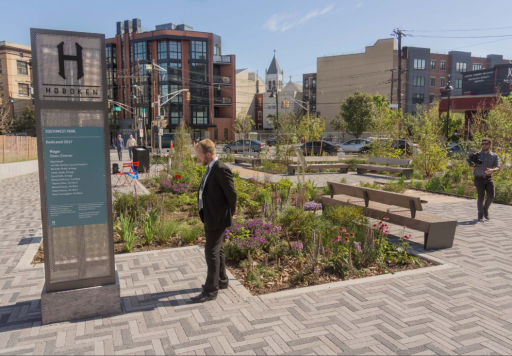 In response to a grassroots civic movement to address flooding and a lack of green space, the City of Hoboken developed Southwest Park, New Jersey’s first resiliency park. The city purchased an underutilized parking lot and hired Starr Whitehouse Landscape Architects and Planners to design the park. 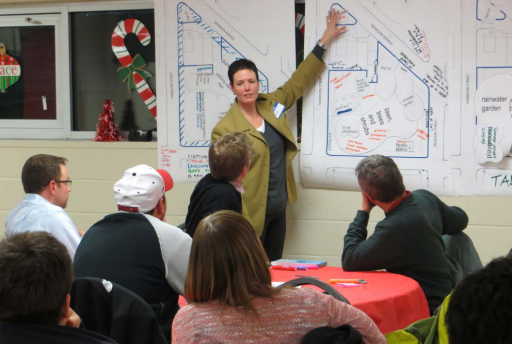 Over the course of three public workshops, the city gathered input from residents to determine community priorities. Residents evaluated programming concepts and provided suggestions. 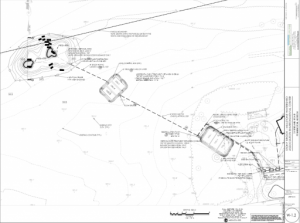 The final design plan was presented to the community and received popular approval. The completed park, which opened on Sept. 22, 2017, features rain gardens, wood deck paths, a granite amphitheater, a dog run, tables and chairs, a bike sharing station, public WiFi, a central plaza, restrooms, and a perimeter pedestrian mall that can accommodate local vendors and food trucks. Three stormwater management systems capture stormwater: open-jointed pavers, rain gardens, and vegetated bioswales. The park’s urban plaza area makes use of open-jointed pavers to create a paved area that is completely permeable. It sits on a bed of gravel that filters stormwater before it returns to the watershed. The rain gardens feature native plants and sandy soil to filter water. Excess water flows into one of three stormwater detention basins that are located underground. The bioswales capture water from adjacent roadways and sidewalks, filtering pollutants and directing excess water to the stormwater detention basins. The three stormwater detention basins capture excess water during heavy storms, with the capacity to hold up to 71,000 gallons. After a storm, the detained water is released gradually into the combined sewer by a sensor that controls the rate of flow. With the stormwater detention basins and stormwater management systems combined, the park can store up to 190,000 gallons in total–enough to provide flood relief beyond the boundary of the park. Taking advantage of the park’s public-facing nature, the City of Hoboken has installed informational signs to educate the public about stormwater management and environmental issues. The park functions simultaneously as a stormwater mitigation system, public space, and an educational tool. 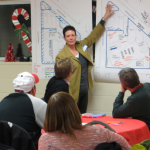 Residents attended public meetings to identify priorities and share their opinions. In December 2016, Middlesex Water Company detected a leak in a transmission main under Route 1 in Edison Township. The leak presented a major challenge. It had to be fixed immediately; the main represented a critical piece of the company’s infrastructure, which serves 61,000 customers in eastern Middlesex County. But its particular location — next to Route 1 and near the Route 287 northbound ramp — created an unusual level of difficulty. A conventional solution would have called for what’s known as open-cut replacement, which would require shutting down two important thoroughfares and excavating the roadway. An experienced crew applies the CFRP lining inside the main. 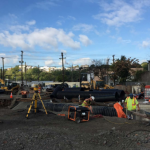 Middlesex Water opted for a more innovative strategy: using a carbon fiber-reinforced polymer (CFRP) to repair the 385 linear feet of pipe. 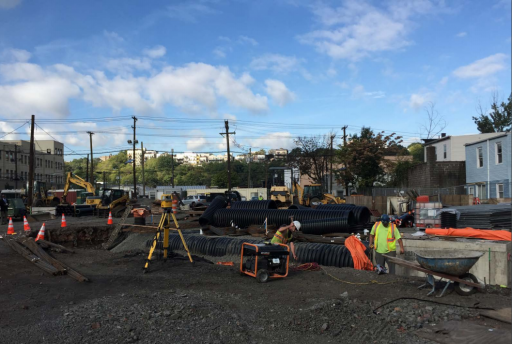 The 30-inch diameter of the prestressed concrete cylinder pipe was large enough for an experienced crew to crawl inside and apply the polymer sheet internally. After hardening, the sheet formed a thin liner that left the internal diameter of the pipe virtually unchanged. This structural rehabilitation extended the main’s integrity for a minimum of 50 years of potable water use. The pipe regained its original hydrostatic pressure capacity and gained load capacity. The repair also allowed the pipe to accommodate increased internal pressure requirements. Most importantly, the project was completed rapidly, with no public disruptions or traffic delays. It was the first time that CFRP had been applied to a pipe section of this diameter and length. While the transmission main was out of service, Middlesex Water undertook an additional proactive step: an internal electromagnetic and CCTV inspection of the pipe to identify any other areas that might need repair. This structural evaluation and assessment provided information about the horizontal and vertical alignment of the main. The electromagnetic inspection revealed that one pipe segment needed imminent replacement. This section of pipe was replaced prior to the CRFP application. By conducting this additional investigation of the pipe before the CFRP process, Middlesex Water ensured that the completed repair was both comprehensive and sustainable. Throughout the repair process, Middlesex Water consulted with local police, fire, and township officials. The company also collaborated with local businesses, the local gas utility, contractors, consultants, the New Jersey Department of Transportation, and the New Jersey Department of Environmental Protection. Once the project was complete, Middlesex Water informed the public of the repair through social media, demonstrating how proactive infrastructure replacement benefits the community. The company also hosted an information session to share its process with other utilities, construction companies, and engineering firms, and will present a paper about the project at several upcoming industry conferences. Middlesex Water shares its process during an educational presentation. 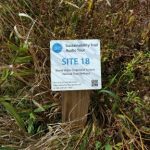 Stony Brook-Millstone Watershed Association needed a wastewater treatment system—and not just any system, but one that aligned with its mission of keeping water clean, safe, and healthy. Septic systems serving the various structures at the Watershed Center in Pennington had failed. Moreover, SBMWA planned to expand its facilities. 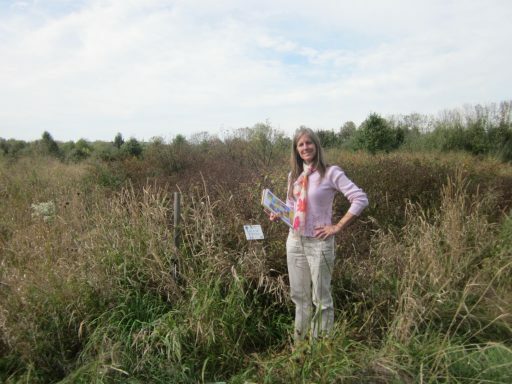 Partnering with Natural Systems Utilities, SBMWA developed a holistic, natural solution: a constructed wetland that would function as a wastewater treatment system. 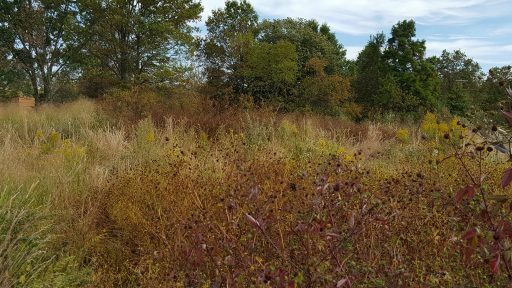 Because the Watershed Center’s combined facilities had to handle more than 2,000 gallons per day, NSU applied for and received discharge to groundwater and treatment works approval permits from the New Jersey Department of Environmental Protection. Once the permits were granted, NSU constructed the wetland in 2014. It commenced operations in 2015 and has achieved a high level of performance since then. 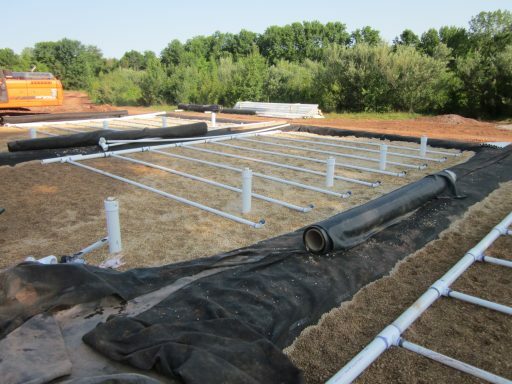 The constructed wetland is a natural, low-energy system that produces a high-quality effluent. Nitrogen is removed prior to groundwater recharge. 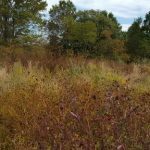 The system also serves as a landscape that increases wildlife habitat and supports biodiversity. The wetland wastewater project is the ideal complement to the LEED Platinum-certified building that serves as the home of the Watershed Center. 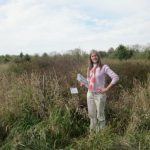 As part of an educational center that has had more than 50,000 visitors since its opening in 2015, the wetland wastewater system provides the public with a strong example of holistic, sustainable water treatment. 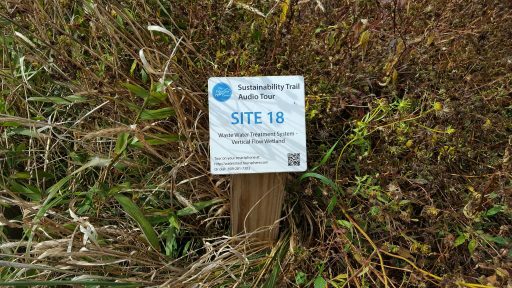 The watershed association has capitalized on the educational opportunities by installing informative signage and a walking audio tour with QR codes for mobile access. Additional signage in restrooms helps visitors understand the connection between wastewater and the wetland outdoors. The watershed also works with nearby municipalities that are interested initiating similar projects.